With Donkey Kong Country a huge success on the SNES, there was, of course, a demand for a handheld counterpart on the Game Boy. 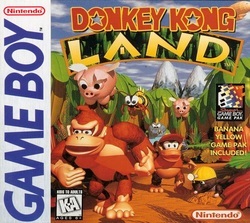 With Rare being a top notch developer, they didn’t just want to make an inferior port of the game to fit the Game Boy’s limitations, so instead they made Donkey Kong Land, a completely unique game. Quite nicely, the game’s storyline reflects that it was made to tie-in with the first game; Donkey Kong and Diddy are relaxing after saving the day in Donkey Kong Country when Cranky starts complaining that their last game was only popular because it had good graphics and there’s no way they’d be able to do it again on the inferior Game Boy system. Eventually, they give in to his criticisms and Cranky calls up K. Rool and arranges for him to steal the Kongs’ banana hoard once again. But while it is technically the same thing again, each of the game’s worlds are entirely unique and, while certain level archetypes (like jungles and caves) are reused, you also get some brand new things as well. There’s a place called Big Ape City where you have levels where you’re running around in a very realistic looking city and I absolutely loved that. You also have some levels on board pirate ships, which are pretty fun and, if you know about the rest of the series, are a nice precursor to Donkey Kong Country 2: Diddy’s Kong Quest. There are also completely new enemies (even bosses) throughout the game, including Hogwash, a flying pig which I’m quite fond of. Though, while this is a fun game, there are certain draw backs which are not present in its SNES counterpart. Obviously, graphics and music have been cut down significantly in order to work for the Game Boy, but I don’t mind that (graphics aren’t everything). It’s other design flaws that I find problematic; firstly, the jumping doesn’t feel quite right. When you jump, it feels quite stiff and that takes some getting used to. There are also some Chimpanzee Clouds levels which are unique to this game; in them you’re in a surreal cloud world and, while there aren’t very many of them, they aren’t very good at all. There’s a lot of riding on really slow platforms and unfair deaths which you don’t think would have happened if the jumping was better. So, on the whole, I think it’s a nice little game and, if you like Donkey Kong Country I’m pretty sure you’ll like this too. If you’ve not really played many Donkey Kong games, however, there are better choices for your first try!